When I was living on the farm in Italy, I was tasked with preparing breakfast for the guests each morning. Breakfast was a hybrid Italian-American affair. The small buffet table next to the kitchen was filled with cereal, yogurt, fruit, our homemade granola, hard boiled fresh eggs and a breakfast cake or scone of the day. We followed a standard recipe for the granola, the eggs were always to be hard boiled, so my only outlet for creativity lay in the breakfast cake. The key to the cake or pastry, was to create something that if necessary could last a day or two in case there weren’t many guests and that the Italians would approve of (not an easy task) and that the Americans would accept as breakfast. So I experimented. I played around with olive oil cakes, hearty scones, pound cakes and honey bran cakes among others. I tried to create more healthful options than the average white cake, enriching doughs with oats, whole wheat flours, wheat germ and ground almonds. I’d add coconut flakes and brown sugar instead of white sugar and replaced yogurt for sour cream. Sure I still creamed butters and added some white flour into the mix. These were not might to be a substitute for a kale smoothie after all and I still wanted them to be tasty! 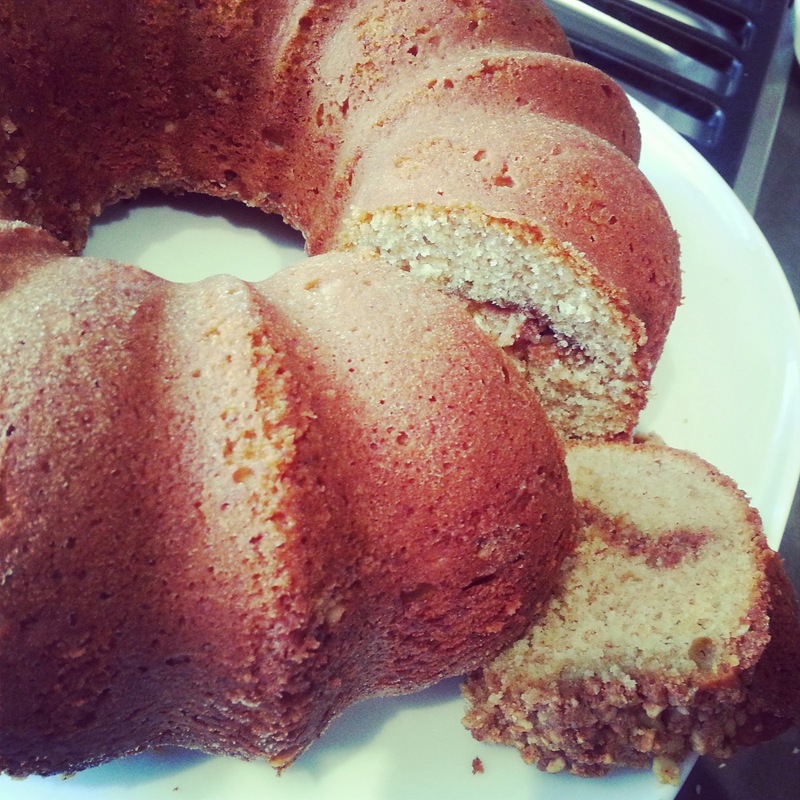 Among the experiments, the coffee cake became my favorite. I originally took a Barefoot Contessa recipe for Sour Cream Coffee Cake (I love Ina) and slowly started to tweak it, given what I had at hand in our kitchen’s pantry. I loved the texture the whole wheat flour and bran gave it. We had almond flour on hand so I used it: fyi it’s not so cheap, but accessible and you don’t need much. If you have a food processor and some almonds, you can make it yourself. It really adds a wonderful lightness and level of moisture to the cake! Italians don’t really have our version packed brown sugar, but have a form of granulated brown sugar that I used instead. Anyways, many variations evolved as a result. No two cakes ever were quite the same. Coffee cake is wonderful because you can eat it as a decadent breakfast or a light(er) dessert. Above all, it is easily frozen and so you can make and enjoy it for a while. So here is one I recently made. More to come! Preheat the oven to 350 degrees F. Grease and flour a 10-inch bundt pan. Cream the butter and sugar in the bowl of an electric mixer fitted with the paddle attachment for 4 to 5 minutes, until light. Add the eggs 1 at a time, then add the vanilla and yogurt. In a separate bowl, sift together the flours, bran, baking powder, baking soda, and salt. With the mixer on low, add the flour mixture to the batter until just combined. Finish stirring with a spatula to be sure the batter is completely mixed. For the streusel, place the brown sugar, flour, cinnamon, nutmeg, coconut, salt, and butter in a bowl and pinch together with your fingers until it forms a crumble. Mix in the walnuts and raisins, if desired. Let cool on a wire rack for at least 30 minutes. Carefully transfer the cake, streusel side up, onto a serving plate. Enjoy!